UFC Fight Night 114 was keenly anticipated and did not fail to live up to, and actually, arguably exceeded one’s expectations. The main bout everyone was talking about was the flyweight match between Sergio Pettis and Brandon Moreno. Both fighters are highly talented and rated; with fans naturally expecting a very competitive match. This was because, in spite of the fact that Pettis was ranked higher than his opponent; Moreno commanded the support of the home crowd, as he was born in Mexico City. The fight was always going to be a close affair, but trusted sports betting operators, like Sportingbet, had Brandon Moreno as the favourite to win. However, this was not to be, as at the end of the match; the judges issued a unanimous verdict in favour of Pettis. The start of the contest saw the fighters come at each other with a ferocious pace; and it seemed that the home advantage would be telling, as Brandon had Sergio on the mat as he caught his leg off a kick. Brandon then attempted to place a rare-naked choke on his man for approximately two minutes; but Pettis managed to hold his nerve, get to his chair and regain his composure. The second round, Sergio tried to keep the fight off the mat, but yet again the home favourite had his opponent on the floor. However, this was only for a relatively brief time, and Pettis benefited from standing exchanges, with superb blows to the head and body. By the start of the third round, the underdog was controlling the pace of the match, and hitting at will an ever-tiring Moreno. Round four started with poke in Moreno’s eye, which was completely unintentional, and there was a break to ensure the fighter was fit enough to continue. The fight restarted with both participants pushing a grueling pace, but no one could really dominate to gain any real advantage. The last round, saw both men physically drained but still with the mental strength and desire to go on for a definitive win. 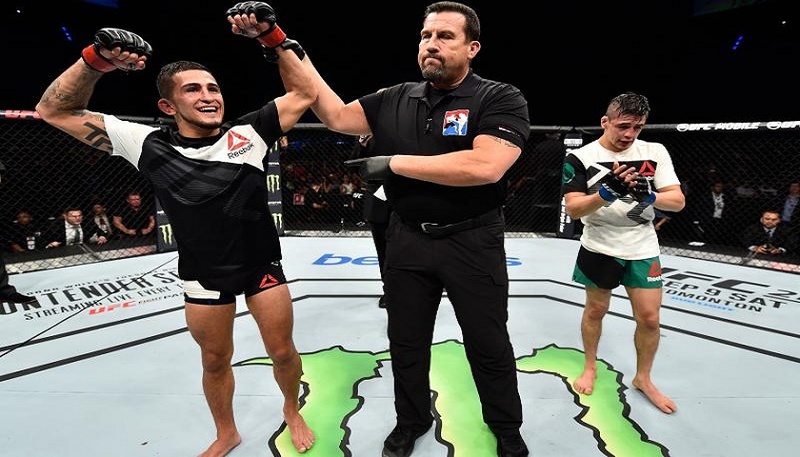 The home fans thought that Moreno should have taken advantage of having his opponent on the mat for more than two minutes; but Pettis somehow regained his feet and the two threw punches unceasingly till the end. The decision has unanimous with scores of 49-46, 48-46 and 48-46; however, anyone witnessing the event would have to agree there was extremely little to choose between the two fighters. The fight was a true reflection on how exciting and engaging this sport has become; and one can understand why fans just can’t get enough of this action!